Applause is one of the best market solutions that equip companies to offer premium digital experience to their customers by developing usable applications. It works across different platforms such as mobile, desktops, digital wearables, smart cars, and web. Gone are days when lab testing would suffice to carry out product testing, nowadays with the ever-changing technologies, products and consumer preferences, there is a need to adopt real time testing solutions to get quality insights about the usability, scalability and feasibility of applications . 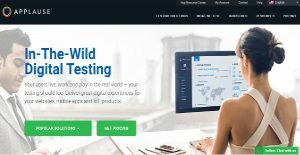 In-the-wild testing approach helps businesses to test their application in real situations, locations, real devices, and on a range of different platforms. Automation in application is one of the demands of today’s users. Applause provides the right set of tools and capabilities for companies to develop applications that go popular with the customers for their 360 degrees quality assurance. It is very difficult to fathom which application is going to work with today’s consumer unless and until some kind testing or research is conducted. Compatible with the notions of revolutionizing technology, Applause provides the capabilities to companies to develop the right applications with the right build, automation, interface and design, security and other resources. With Applause, companies can conduct crowd testing which allows obtaining real results and insights with the professional testers. It gives you the direction or impetus to develop the applications that would satisfy the consumers; making the whole application development process a success. The testing features are immense result drivers with regards to the application development. The feature of mobile sentiment analysis helps you to gauge the likability of the applications by the users and how well they review the application product on the Applause Score. The comparative analysis and benchmarking are useful for gearing up the process. With security testing, you can know how the applications work or will work on the standards of security. This is another feature that consumers are always looking out for. If the application is secure enough in its dealings and offerings, only then they are expected to use the application. Other testing solutions of automation, beta management, localization, functionality also offer an incredible testing capability for applications, ensuring a successful application lifecycle management and development. If you are interested in Applause it may also be beneficial to analyze other subcategories of Best Test Management Software gathered in our database of SaaS software reviews. It is essential to keep in mind that hardly any service in the Test Management Software category is going to be an ideal solution able to match all the requirements of all company types, sizes and industries. It may be a good idea to read a few Applause reviews first as certain services may dominate only in a really narrow group of applications or be created with a very specific type of industry in mind. Others might operate with a goal of being easy and intuitive and therefore lack advanced functions welcomed by more experienced users. There are also services that focus on a wide group of users and provide a complex feature base, however this in most cases comes at a more expensive cost of such a service. Make sure you're aware of your needs so that you select a solution that provides exactly the functionalities you look for. How Much Does Applause Cost? We realize that when you make a decision to buy Test Management Software it’s important not only to see how experts evaluate it in their reviews, but also to find out if the real people and companies that buy it are actually satisfied with the product. That’s why we’ve created our behavior-based Customer Satisfaction Algorithm™ that gathers customer reviews, comments and Applause reviews across a wide range of social media sites. The data is then presented in an easy to digest form showing how many people had positive and negative experience with Applause. With that information at hand you should be equipped to make an informed buying decision that you won’t regret. What are Applause pricing details? What integrations are available for Applause? Pros: Great product for quick app improvement. We are able to put the content to the suit and it can be sorted on database. It is very helpful app and I am very satisfied that we finally found a way to automate it. The UI examples are incorporated with stage and helps us to do the work quickly and effortlessly. Out IT department can customize the venture app in less time and with greater flexibility. Cons: When we tested our windows app, we faced some issues. In the development phase it didn’t catch some glitches, and we found about it later. Sometimes it breaks down and we need to quit app. But, for Android and iOS device work perfectly. Pros: We all know testing web or mobile app how difficult can be with all those operating systems types, versions, screen resolutions and many other factors. Applause solve the problem with in-house testing for small businesses. They provide specific testing option so you can test your app on different devices. It has great coverage of Oss and some other devices for testing, and you don’t need to buy various devices in order to test your app. You are able to control the tests and to link with Applause testers whenever you want. You will get updates no matter the status of the tests, the interface is extremely user friendly and intuitive, they even offer multilingual test so you can test the app in your native language if you wish, and it has integrations with many bug tracking systems, testers can attach video clip or even screenshot to the bug report as well. Their customer support is fantastic. Cons: If your testers are not familiar with the app they need to test it takes time for testing process and test cycles, testers level is very important because they need to dig deeper to find even some hidden issues so they need more detailed testing plan that has to be prepared by the developer. It takes some time to learn how to use the program more effectively. It is expensive tool but on the other hand you don’t need to buy many other devices for testing. If you need more information about Applause or you simply have a question let us know what you need and we’ll forward your request directly to the vendor.